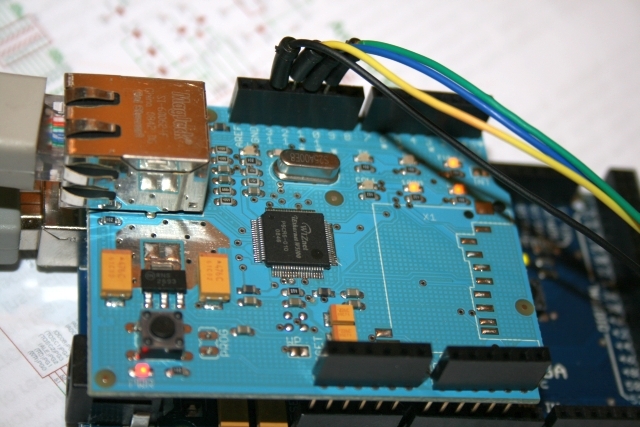 This entry was posted on Monday, April 6th, 2009 at 6:54 pm and is filed under Arduino / Freeduino. You can follow any responses to this entry through the RSS 2.0 feed. Responses are currently closed, but you can trackback from your own site. I need this kind of hack on the duemilnove because I want to use the pin 10 pwm but I couldn’t make it work. I move the ss on pin 9 and change the code accordingly(BIT1 instead of BIT2)and it doens’t work, any idea ? I try also pin 8. 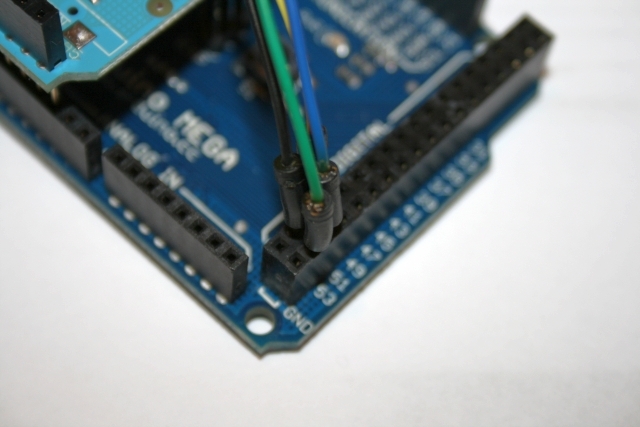 It is what I have done, when using pin9 I used bit 1 portB for SPI0_SS_BIT and IINCHIP_CS_BIT and I also put bit0 in PORTB |= SPI0_SS_BIT | BIT0 and it doesn’t work. 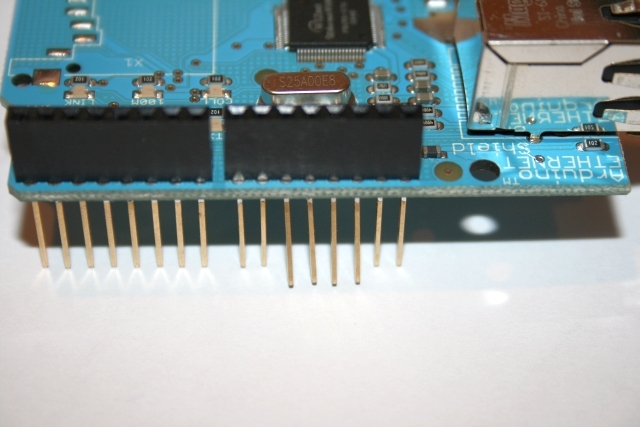 The 3 other pins are standard connection of the etherent shield on the duemilnove. 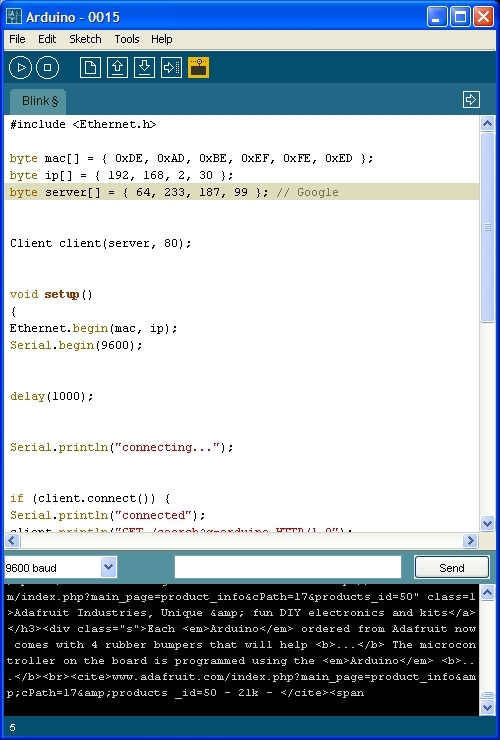 I use the webserver example from the ethernet library (it is working in normal configuration) but in this case it pass server.begin() and stop there. Perhaps I miss something or there is a difference between the mega and the duemilnove and I can’t use pin 8 or 9 ?? I finally made it works. 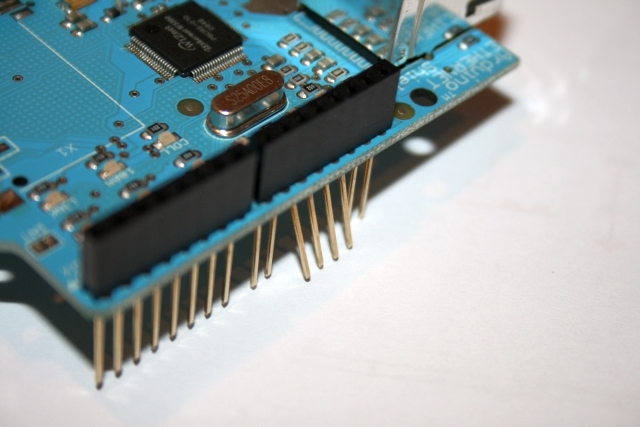 BIT0 is the original SS signal on the Arduino Mega but on the Duemilnove, it is BIT2. 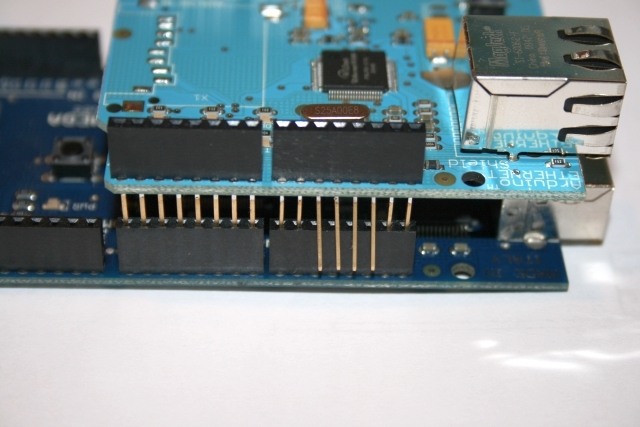 My configuration is SS on pin8 (bending the pin 10 of the ethernet shield and making a jumper between 8 and 10 on the ethernet shield), the other pins don’t move. 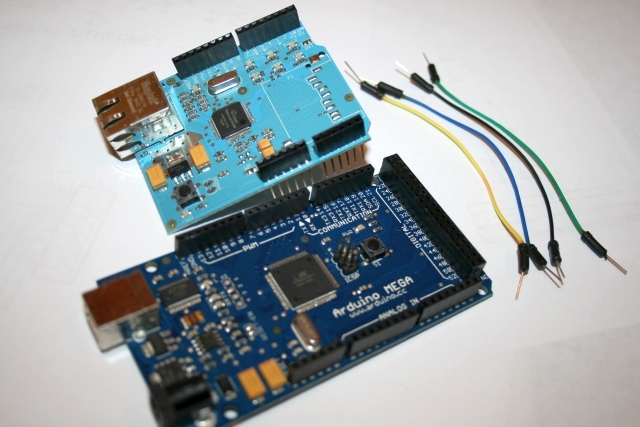 Hi guys i’ve an arduino mega board….i’ve followed your hack guide but my ethernet shiled still not work!!! I’ ve leave out pin 10 only (now connected with pin 53). I’ve changed lines in spi.h but when i try to run WEB CLIENT example i received : CONNECTING…..CONNECTION FAILED…..DISCONNECTED. Can you help me plase? any idea on how to make them work together??? i need to log some sensors, save the data in the SD. 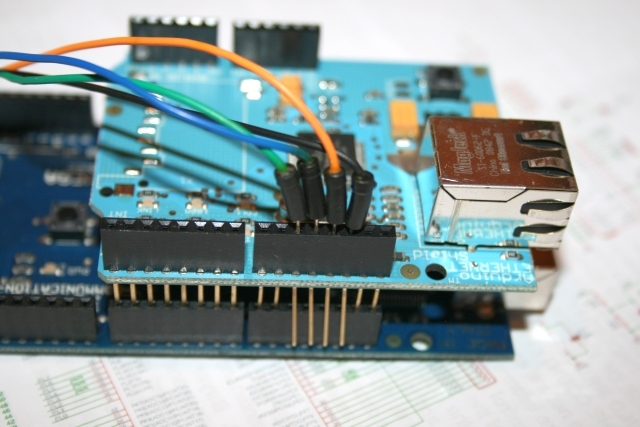 I’m using the WIZnet 812MJ with the adafruit ethernet shield kit, I’ve modified it as shown above but the code hangs on ethernet.begin(mac,ip). Do I need to do what toffe82 did? I don’t need any PWM pins so I don’t care about losing them. 1. Whats the DIR for the SPI.h file .. and are there supposed to be multiple ones? 2. I looked for the lines in this spi.h file im supposed to replace and was unable to find any of them .. what gives ? 3. the MAC address .. should this be replaced with the numbers from the back of my ardunio ethernet card .. and if so .. in what format? am i supposed to leave the 0x in each of the 6 values? Many thanks for anyone that can help me please. 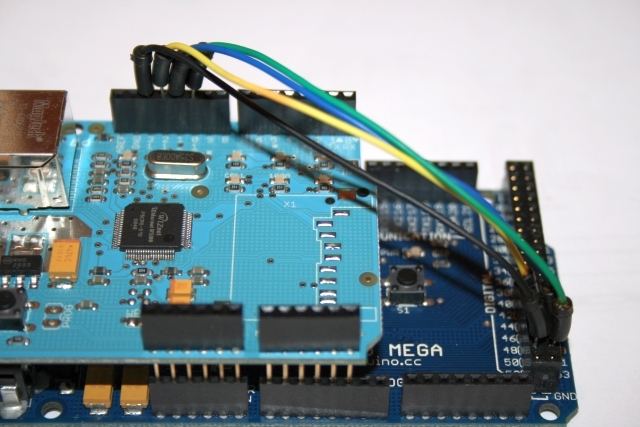 sorry folks I just noticed that the ethernet shield I’m using has a comment “MEGA compatible” and after reversing the hardware mods just plugged it in, pulled up the example code (entered minor changes for MAC and ip address) it ran both the webclient and webserver code. Please write me, what I have to change. I only want use the CAN-Bus-function.